This domaine offers only two wines, both Grands Crus, from 11 hectares situated on the rounded hill of Corton. One Grand Cru is the white Corton Charlemagne, the other is the red Corton Grand Cru, produced from vines with an average age of 45 years old. Approximately 30% new oak is used with a 'rendement' of around 30 hectolitres per hectare. The owners, the le Bault de la Moriniere family, date back to the late 19th Century and began marketing their own domaine bottled wines from the 1970s as opposed to historically selling their harvest off to the local negociants. 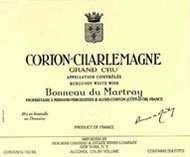 The Bonneau du Martray Corton Charlemagne Grand Cru is a wine of impeccable finesse and a benchmark in quality for other Burgundian producers to try to attain.